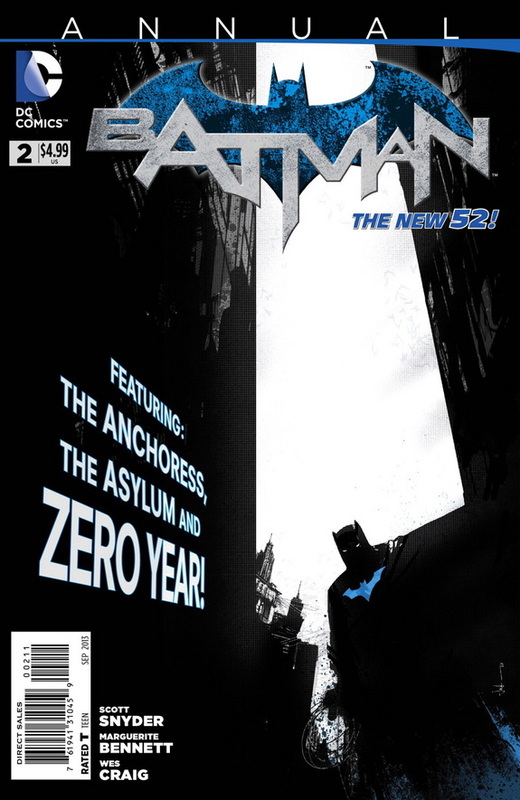 Batman Annual #2 is a Zero Year tie-in by Scott Snyder and new writer Marguerite Bennett, with art by Wes Craig, where a turning point from Bruce Wayne’s first year as Batman returns to haunt him, as one of Arkham’s oldest inmates plots their escape. The story by Scott Snyder and Marguerite Bennett, written by Bennett, introduces us to Eric Border, a new orderly who has just arrived from Metropolis to work at Arkham Asylum. During a tour of the facilities Hall of Fame (where Batman’s deadliest foes are held) by one of Dr Jeremiah Arkham’s assistants, Mahreen, Eric becomes curious about the old wing of Arkham where the asylums first inmate, the Anchoress, is still locked away. Meanwhile, over in the new Tartarus Wing, Batman has agreed to help Dr Jeremiah Arkham test the security systems, allowing himself to be imprisoned so he can see how well the automated security will cope with any potential break out. 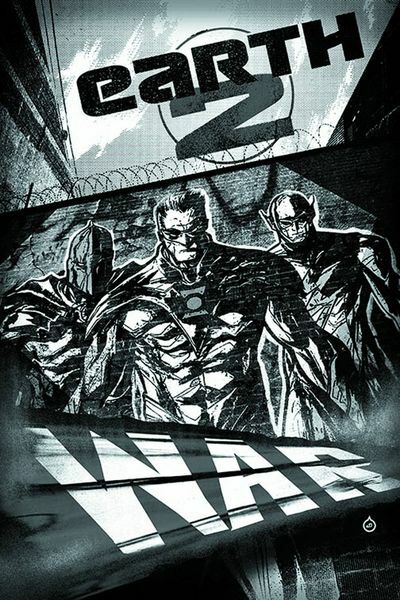 After escaping his cell, Batman puts the high-tech security systems through their paces, while Eric returns to the old wing of Arkham to visit the Anchoress – who is secretly planning to escape and take revenge on Batman for all the chaos and evil that she believes he has inadvertently inflicted upon Arkham during her incarceration. Marguerite Bennett, recent MFA graduate and former student of Batman writer Scott Snyder, has done a fantastic job writing Batman Annual #2 and her debut storyline nicely encapsulates the essence of Zero Year, brining a new insight into Bruce’s early career, weaving these events seamlessly into Batman’s mission at Arkham Asylum in the present. We are introduced to some great characters: Eric has a caring and sensitive outlook towards his new job at Arkham, he is welcomed by Mahreen, who takes the time to help show him around on his first day, which is more than can be said for Jeremiah Arkham, who has little time or patience for the new orderly. The real standout character of Batman Annual #2 is the Anchoress, a troubled individual who rebelled against her parents wishes, and unwittingly caused the accident that killed them. Wracked by guilt, she became just like the old anchorites, someone who willingly locked themselves away to live out a life of remorse. At first her time at Arkham was relatively peaceful, the asylum was more like a sanctuary for her, but when Batman arrived in Gotham the asylum began to change. It was no longer the place of healing she had once so desperately craved, instead it became an evil place of darkness and punishment. The Anchoress also has a unique ability of her own, one that she intends to use to punish Batman who she blames for how she was left forgotten and alone in the old wing of Arkham. When the Anchoress confronts Batman, we learn how Bruce first encountered her during Zero Year, and we discover just how great a significance that event now holds for them both. In her attempt to create the perfect cage for Batman, she attempts to use Bruce’s own memories to ensnare him in her trap, torturing him with a plethora of the personal tragedies that drive him. Marguerite Bennett takes us to the inner world of Batman’s secret torment, drawing on some of the most defining moments that have shaped Bruce’s life. The sublime horror of these moments plays out like a waking nightmare for Batman, which linger long after the Anchoress is defeated. I like the way the art by Wes Craig for Batman Annual #2 strikes just the right balance between the high-tech Tartarus Wing and the older, more foreboding areas of Arkham Asylum. The way Batman escapes from his cell is ingenious, and he assesses each of the automated systems in exactly the same way that members of his rogues gallery would, leading to some exciting moments as he has to outwit a number of the Asylums sophisticated countermeasures. Later, when under attack by the Anchoress, the dark visions Batman experiences are brilliantly staged, each successive jolt of fear becoming intensified by Wes Craig as we witness Bruce’s horror firsthand. With a fantastic cover by Jock, Batman Annual #2 is a fine addition to complement Snyder and Capullo’s Zero Year. With its dark and compelling narrative, wealth of intriguing and well developed characters, Batman Annual #2 forges an indelible link with the events of Zero Year and offers a new insight into the motivations and forces that played a role in Bruce’s early years. The Flash looks set to get his own series after he makes an appearance in the second season of CW’s hit superhero series Arrow. CW president Mark Pedowitz made the announcement at his platform Tuesday during the Television Critics Association’s summer press tour, revealing that his network will be fast-tracking Flash, a new drama based on the popular DC Comics superhero who is also a member of the Justice League of America. The project is already taking shape, with Berlanti, Kreisberg and DC Entertainment’s Geoff Johns, consultant and writer on Arrow, writing the new Warner Bros Television show. The director of the Arrow pilot episode, Nutter, will also be involved in the back-door pilot, with Berlanti and Kreisberg serving as show runners if Flash should become a full series. It seem that Marc Guggenhiem, who also developed and executive produces Arrow, wont be involved, but he will instead be concentrating on season two of Arrow. Pedowitz also added that Amazon (the Wonder Woman prequel) is now on pause while the network turns its attention to the Flash, while over on Arrow, the Black Canary will also be introduced during its upcoming season. “It’s better to wait and get it right than put it on now,” he continued, as the script is yet to be where he would like it to be. Flash will be the third spinoff for one of the network’s current series, they will bow The Vampire Diaries spinoff The Originals in October, and the network is also preparing a Chicago-based spinoff for Supernatural that will be shown as a backdoor pilot in the ninth season – along with supervising producer Andrew Dabb writing the episode. 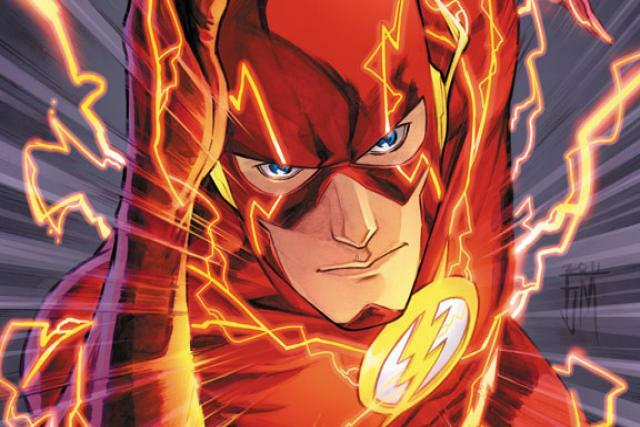 Berlanti is also in the process of developing a Flash movie for Warner Bros and DC Entertainment. This is exciting news for fans of the Flash, and it’s fantastic that this popular DC Comics character looks like he is finally getting his chance in the spotlight. 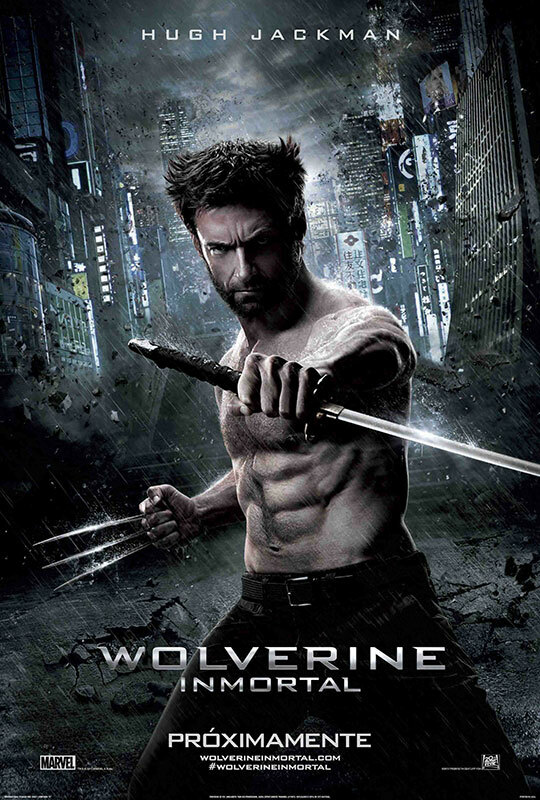 The Wolverine claws his way back onto the screen as Hugh Jackman returns to the role of the adamantium clawed mutant, in director James Mangold’s exceptional film that draws its inspiration from the classic 1982 comic book mini-series by Chris Claremont and Frank Miller. After the critical mauling that greeted Wolverine’s previous solo film, the dire X-Men: Origins (2009), the series was left in serious need of a healing factor. The success of Matthew Vaughan’s X-Men First Class in 2011 (which included a scene stealing cameo by Jackman) revived the film series, and with Bryan Singer also returning to the X-Men franchise to helm the eagerly anticipated Days of Future Past, its now time for Logan to return in director James Mangold’s film: The Wolverine. The Wolverine opens with a flashback to 1945 in Nagasaki where Logan (Hugh Jackman) is being held prisoner by the Japanese. He manages to escape as the atomic bomb is detonated, and protects one of the Japanese soldiers by shielding him from the blast with his own body. 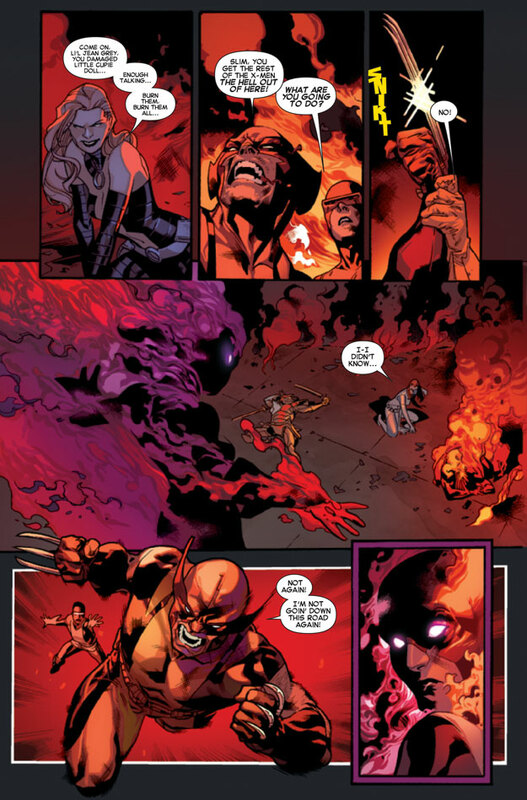 The man called Yashida watches in awe as Logan’s mutant healing factor allows him to regenerate almost instantly from the effects of the explosion. Years later we rejoin Logan in the present day, a broken man after the death of Jean Grey, he is now living a solitary existence in the wilderness. Haunted by the ghost of Jean Grey, the woman he loved but was tragically forced to kill, life no longer has any meaning for him. 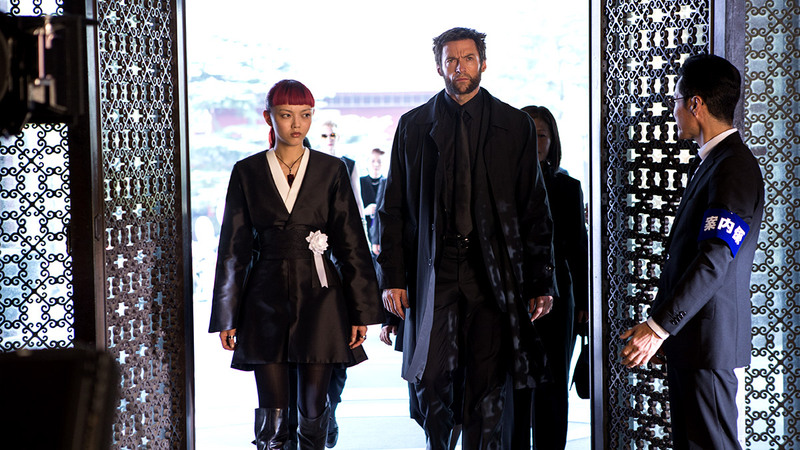 When the flame haired assassin Yukio (Rila Fukushima) tracks Logan down, she persuades him to return with her to Japan for a meeting with the elderly Yashida (Hal Yamanouchi), who is now an extremely rich and powerful man – and it appears that the old debt from Logan’s past can finally be settled when the ailing Yashida offers Logan the opportunity to be free of his immortality. Soon afterwards, Logan finds that he has been stripped of his mutant healing powers. He is then faced with the task of protecting the heiress to Yashida’s dynasty, his granddaughter Mariko (Tao Okomoto), as the Yazuka attempt to kidnap her. Hunted by a gang of deadly assassins led by the sinister Viper (Svetlana Khodchenkova), Logan must face up to his innermost demons as his relationship with Mariko develops, with the sword wielding Yukio as his only ally, he will have to unleash the full fury of his adamantium claws to defeat Viper and the Silver Samurai. While it may not match the visual spectacle of The Avengers or the brooding legacy of The Dark Knight trilogy, The Wolverine shifts the focus away from the city levelling format of recent blockbusters such as Man of Steel to offer a more complex, and character driven film. With influences ranging from epic Samurai dramas, Westerns, and even subtle hints of film noir, The Wolverine takes us to the menacing neon-lit streets of Tokyo and plunges us right at the heart of a power struggle within the criminal underworld. The Wolverine is a stylishly crafted film from Walk The Line and 3:10 to Yuma director James Mangold, who perfectly balances the films more serious moments with occasional flourishes of humour and exhilarating action sequences. 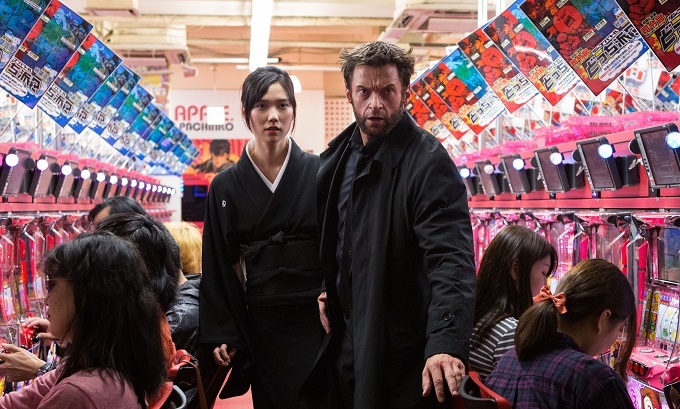 The first half of the film sets up the story perfectly, introducing characters and exciting set-pieces, before Wolverine’s powers are taken and he begins to grow close to Mariko. The events of X-Men Last Stand (2006) continue to be felt, as visions of Jean Grey continues to haunt Logan’s nightmares, and the film skilfully addresses his inner turmoil as Logan finally begins come to terms with his guilt over his role in her death. Hugh Jackman is fantastic as Wolverine; he rightfully takes centre stage here, bringing an added depth to the character as he embarks on his quest of self-discovery. Tao Okomoto also acquits herself well as Logan’s love interest, Mariko, but it is Rila Fukushima’s excellent performance as Yukio that really steals the show. The red haired assassin, who has the ability to foretell death, proves to be a great sidekick for Logan, and her acrobatic fighting skills are an awesome sight to behold. Hirokyuki Sanda is also excellent as Shingen Yashida, Mariko’s father, a man driven by his lust for power. Svetlana Khodchenkova plays the sleazy Viper, a venomous snake tongued villainess, but the characters full potential is not really explored, and subsequently feels a little undeveloped as a result. The mysterious archer Harada (Will Yun Lee) gets some good scenes, the Silver Samurai is also impressive, and has a great battle with Wolverine. The Wolverine does have a few pacing issues, particularly in the middle section where the plot begins to drag a little, but fans of the comic books are sure to appreciate the more layered approach to the story and the development of Logan’s character. There are plenty of action scenes as well: with a beautifully orchestrated attack at a funeral, a spectacular assault by ninjas on the snowbound streets, Wolverine’s impressive confrontation with the Silver Samurai, and a stunning high-octane fight on the top of a bullet train. 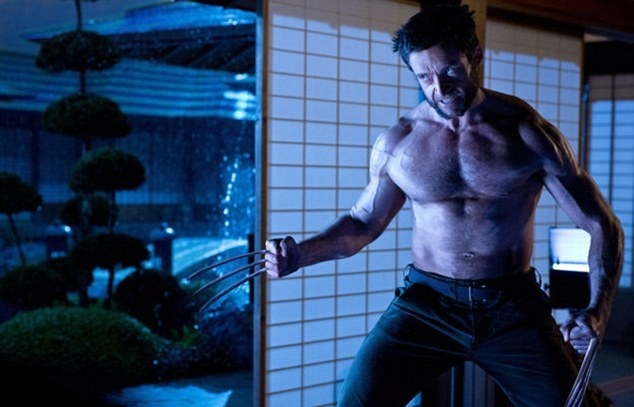 By taking Wolverine out of familiar territory and placing him in Japan, director James Mangold exceeds all expectations, along with screenwriters Mark Bomback, Scott Frank, and Christopher McQuarrie, to create a modern-day setting full of deadly adversaries and brutal violence while seizing the opportunity to explore Logan’s character in greater depth. With a plot full of twists and turns, there is plenty to recommend here, it is only during the final act where things begin to unravel a little as the somewhat chaotic finale does seem to undermine the exquisite care and attention to detail lavished on the earlier scenes in the film. It may not be quite the Wolverine film we were all hoping for, but it comes pretty damn close, and be sure to sick around for a great little scene in the end credits. It was announced today that the Daleks will be returning to face The Doctor’s – Matt Smith, David Tennant, and John Hurt in the Doctor Who 50th Anniversary Special. There were also trailers for the 50th Special and An Adventure in Space and Time shown at the San Diego Comic Con, which will be released soon. Returning to BBC One on 23 November this highly anticipated adventure will star: Matt Smith; Jenna Coleman; David Tennant; Billie Piper; John Hurt and Joanna Page. In a surprise twist in the recent series finale, The Name of the Doctor, it was revealed John Hurt would be playing a Doctor, alongside Smith and Tennant. The Doctor Who 50th anniversary episode was filmed earlier this year at BBC Cymru Wales’ Roath Lock Studios in Cardiff and across South Wales. Filming also took place in iconic London locations the Tower of London and Trafalgar Square for a huge stunt, which saw Matt Smith dangling from a TARDIS alongside Nelson’s Column. The official BBC Doctor Who Website has just released the first pictures of the Daleks return in the 50th Anniversary special. Check out these amazing new pictures of the Daleks! 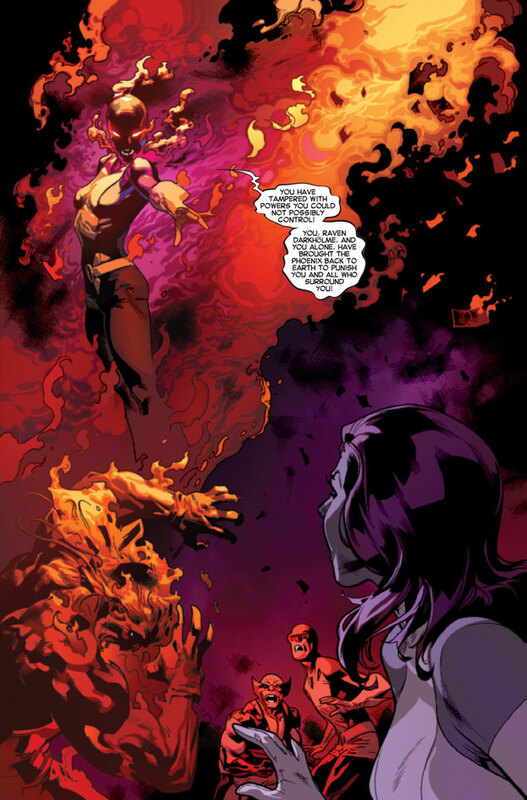 Brian Michael Bendis and Stuart Immonen have crafted another fine issue of All New X-Men as the sudden appearance of the Phoenix Force throws everyone off balance. All New X-Men #14 has the Original X-Men coming face to face with something they can scarcely begin to understand, while Kitty and Wolverine must face the unimaginable dread of Jean becoming Phoenix at an age where she can hardly even control her original powers. All New X-Men #14 sees the X-Men, the Brotherhood and Hydra reeling from Jean’s sudden manifestation of the Phoenix Force. By catching Jean off guard with the illusion of Jason Wyngarde, the original Mastermind and Regan’s father, Lady Mastermind hoped to make Jean suffer for destroying her family, and when Jean appears to be transforming into Phoenix, it looks as if history is about to repeat itself. However, Brian Michael Bendis ingeniously blindsides those of us who thought the Phoenix effect was another one of Lady Mastermind’s illusions, when the X-Men realize that it is Jean who is projecting the Phoenix image to deceive their enemies. Jean’s inexperience with her powers means that she has inadvertently projected the image into the minds of the Original X-Men, Wolverine, and Kitty Pryde as well. Fortunately for Jean she is able to regain control before Wolverine’s attempt to end the Phoenix menace gets her slashed by his claws, just as Lady Mastermind strikes back with an illusion of Professor Charles Xavier to give the Brotherhood and Hydra a chance to regain their senses. The warehouse soon becomes a raging battle ground, with the Original X-Men proving to be more than a match for their opponents: as Cyclops, Iceman, and Beast deal with Sabertooth and the Silver Samurai, while Jean gives Lady Mastermind a taste of her own medicine, Kitty takes on Madame Hydra and Wolverine confronts Mystique. The art by Stuart Immonen on All New X-Men #14 is as fantastic as ever, together with Wade Von Grawbadger’s inks, and the welcome return of Marte Gracia’s fantastic colors, this issue looks absolutely stunning. All New X-Men #14 places the Original X-Men right in the thick of the action, it’s great to see them battling the likes of Sabertooth and the Silver Samurai, and Stuart Immonen really captures the youthful sense of exuberance that makes their teamwork and tactics so effective. 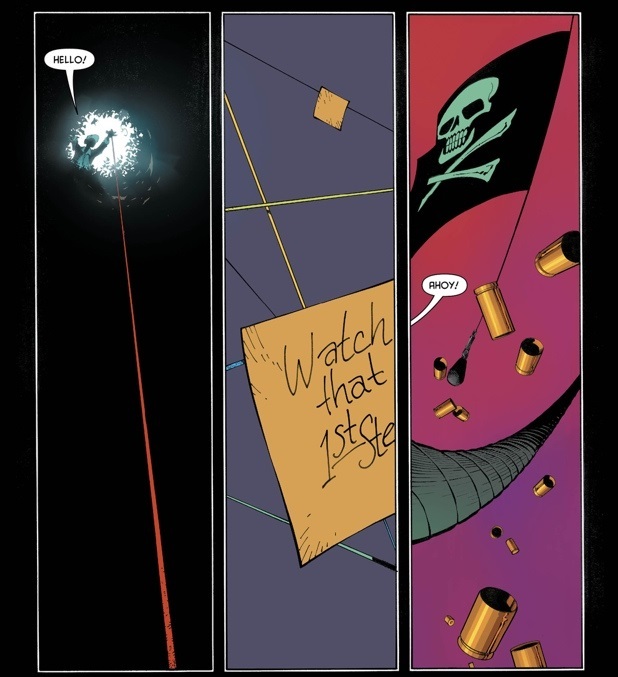 There are some really fun moments after Lady Mastermind attempts to cover her escape with an illusion of the Uncanny Avengers, especially once the real Uncanny Avengers turn up at the scene after Kitty has captured Regan, and Iceman throws a snowball at Thor because he thinks that the Uncanny Avengers are still an illusion. The young Iceman continues to say and do all the wrong things at the most inappropriate moments, it’s hilariously funny, and the way the God of Thunder responds to Bobby’s mistake is brilliant. Brian Michael Bendis also manages to include a nice little interlude between Alex and Scott, with a Summers brother high five, it’s a great scene, and follows on nicely from their first encounter during the last issue. Mystique is imprisoned in The Cage Extra-Max Prison at the end of the issue, but as Maria Hill quickly discovers, it’s not easy to keep Raven Darkholme under lock and key. By the end of this issue Bendis’ takes the opportunity to hint at just how profound an effect Jean’s foreknowledge has had on her, as she sits alone on the basketball court pondering over the memories behind of the Phoenix image she projected psychically during the battle. 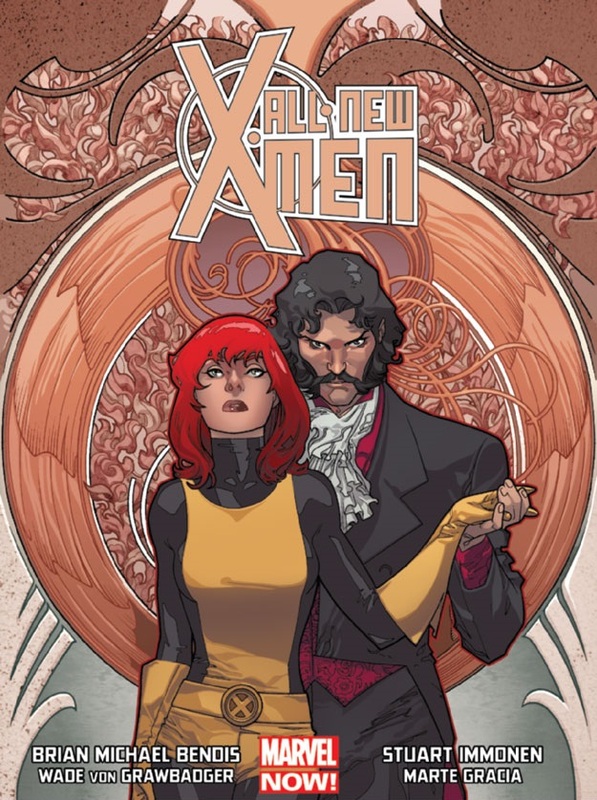 The cover of All New X-Men #14 by Immonen, Grawbadger, and Gracia depicts the young Jean Grey being led towards us by Jason Wyngarde. This stunning cover is as sinister as it is opulent, with Jean entranced by Mastermind against a lavish backdrop, providing a chilling reminder of how Wyngarde’s influence originally transformed her into the Hellfire Clubs Black Queen – an event that ultimately led to Jean being corrupted by her own power during the Dark Phoenix saga. All New X-Men #14 is another superb issue by Bendis and Immonen, the Original X-Men get to fight side by side with Wolverine and Kitty, and the foreboding coda as Jean reflects on her actions hints that things might not have been resolved as easily as we thought. When the Saviors arrive early for their next tribute from Alexandria, the survivors are left with no choice but to let them in, and in Rick’s absence Spencer tires persuade Negan to help him kill Rick so he can take over as leader. However, his treachery doesn’t impress Negan, and the Savoirs leader stabs Spencer in front of everyone, spilling his guts all over the sidewalk. The Walking Dead #112 begins as Rick and his team return to Alexandria, where they are attacked by Walkers after nobody is around to open the gate for them. The Walking Dead #112 hit’s the ground running and Robert Kirkman hardly gives us a moment to pause for breath as Rick leads his people in launching a surprise attack against Negan. All their careful planning with Ezekiel at the Kingdom goes out the window, as Rick, enraged by what the Savoirs leader has done to Spencer, resolves to take Negan out. This is a moment that Kirkman has been slowly building up to for a while now, with Rick and Negan constantly baiting each other, it seem that this time Negan may have finally pushed Rick over the edge. 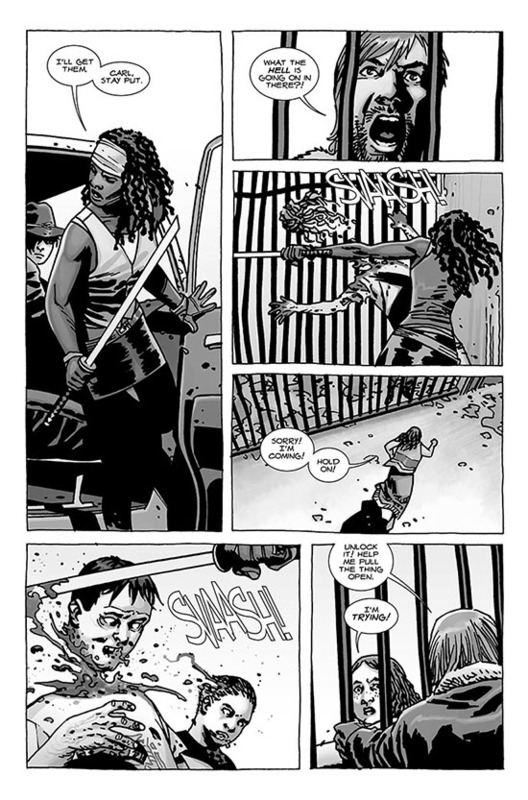 Negan is as twisted and vulgar as ever in The Walking Dead #112. The way he continues to taunt Rick about how he killed Glenn, while waving his beloved baseball bat “Lucile” in front of Rick’s face, is really chilling. You just know that something is about to give, so when Rick orders Andrea to attack Negan’s truck with her sniper rifle from the bell tower, it looks like Negan is finally about to get what’s coming to him. The next thing we know Neegan is scrambling from the cab of the truck, clutching for Lucile as Rick advances, gun drawn and ready to blast his brains out. This is the first time we have really seen Negan under attack like this since Carl attempted to kill him back in issue #104, although his initial reaction here is more one of rage than of shock, and it quickly becomes apparent why as Negan swiftly turns the tables on his attackers. The Walking Dead #112 is a marked change of pace for the series, although it has been great to explore some of the supporting characters in greater detail, events have been moving very slowly over the last few issue as Rick plotted against the Saviors with Ezekiel. With the “All Out War” storyline now on the horizon, an epic 12 issue arc beginning in October that will be published bi-weekly, events look set to kick into overdrive as Rick and his people find themselves on the back foot against Negan and the Saviors once more. Charlie Adlard’s art for The Walking Dead #112 brings a startling clarity to Rick’s fury he gets up close and personal with Negan, at times Adlard’s work almost makes you feel as if Rick is screaming out the page at you. His rage is then channelled into striking back at Negan, with the final scenes depicted in a fantastic double page spread as the issue races towards its nerve shredding climax. 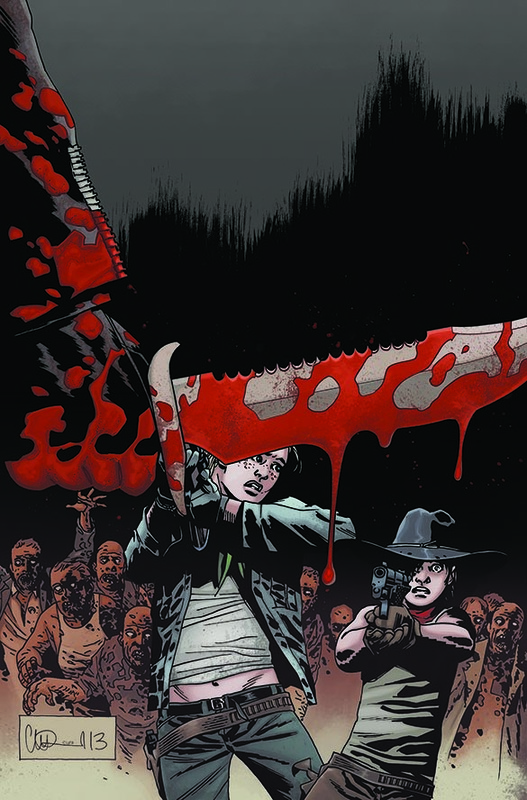 The Walking Dead #112 may not be one of the best issues the series has had for a while, but it certainly raises the stakes, and sets up the confrontation we have all been baying for ever since Negan killed Glenn. While it may not offer any actual resolution to the conflict, The Waling Dead #112 marks a significant turning point in the hostilities, and it paves the way for the ultimate showdown between the Saviors and the Hilltop communities. Batman #22 delves even further into Bruce Wayne’s past as the second chapter of Zero Year sees Bruce taking drastic measures during his next confrontation with the Red Hood Gang. There is also some unexpected resistance from the Penguin, tensions run high when Alfred speaks his mind, and Bruce is caught of guard by Philip Kane – his uncle and advisor at Wayne Industries – who is secretly plotting with Edward Nygma to kill him. Scott Snyder and Greg Capullo’s next instalment of Zero Year continues to explore the formative years of Bruce Wayne’s crime-fighting career, as he infiltrates the airship carrying Red Hood Gangs next target – Mr Luca Falcone. However, Mr Falcone’s faith in his subordinates proves to be his undoing. Although his disguise is soon compromised, it does afford Bruce the opportunity to finally get close enough to attack the Red Hood. 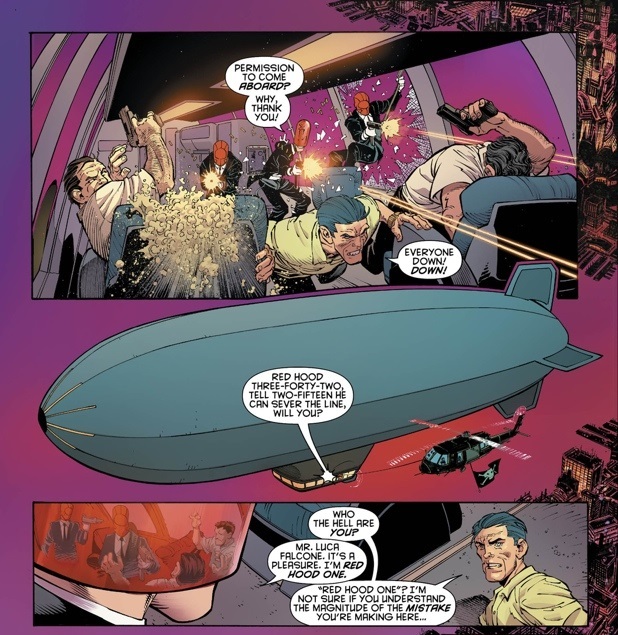 After the encounter in the skies above Gotham necessitates a swift exit, Bruce returns to his base of operations, but he is disappointed when the DNA sample that he managed to get from the Red Hood fails to proved him with any new leads. 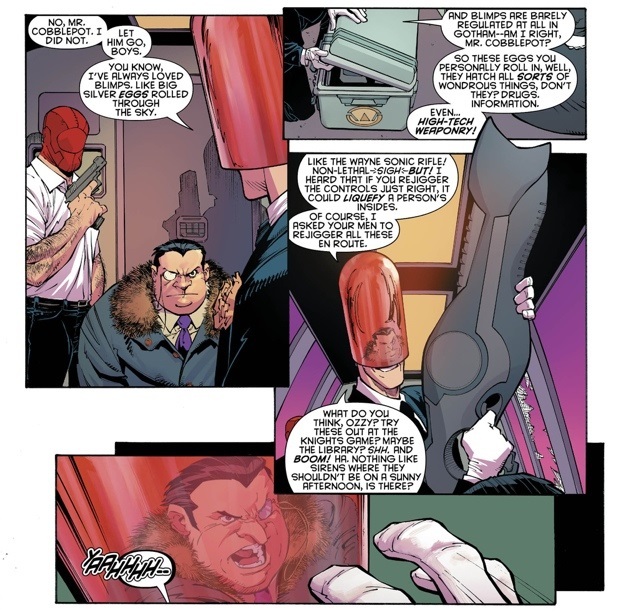 Frustrated that the Red Hood has managed to steal sonic weapons from Wayne Tec, and with Cobblepot also proving to be a dead end, Bruce is then forced to face up to Alfred’s doubts out his “war” on crime. Bruce contacts his uncle, Philip Kane, and arranges to meet him at the museum at midnight to discuss the stolen weapons. He wants Philip to shut down operations until the Red Hood Gang is stopped, but his uncle is more concerned about persuading Bruce to announce his return to Gotham and come back to Wayne Enterprises. Philip Kane has one more surprise for Bruce, one that takes the decision out of his hands, and forces his nephew back into the limelight. While the true identity of the Red Hood remains a tantalising enigma, this issue continues to embellish the mystery surrounding the character, with his dialogue sounding increasingly like a saner version of the Joker. It is entirely possible this is all just an ingenious red herring, one designed to keep us all guessing, allowing Snyder to push the boundaries of our expectations of Zero Year as we eagerly scour ever page for clues. I also really enjoy how Scott Snyder refers back to the discovery of the cave while highlighting Bruce’s bond with Alfred in the present, balancing the terror of the moment where Bruce explored the cave in his childhood with the mutual respect and trust he now shares with Alfred which serves to make their furious argument all the more poignant. Bruce is still young, inexperienced, and more than a little arrogant. So when Alfred voices his concerns it leads to a bitter exchange of words between them, a few home truths are vented, and the end result is perhaps exactly what Bruce needed hear at this point in his life. Edward Nygma steps out of the shadows in Batman #22 to confront Bruce. In a brilliantly crafted scene, Snyder builds up the underlying menace of their confrontation, it’s almost as if Nygma is sparing intellectually with Bruce, and as a result their face-off seems even more bruising in the absence of costumes, fighting, and high-tec gadgetry. The wordplay here is outstanding, as Nygma and Bruce face each other, with Nygma’s pointed remark about the Egyptian Sphinx hinting at perhaps a more significant feline reference. The art by Greg Capullo and inks by Danny Miki for Batman #22 are as fantastic as ever, their work on this story arc is proving to be some of their best yet on the series and the colors by FCO Plascencia are superb. Gotham City looks magnificent as the airship is attacked by the Red Hood Gang. 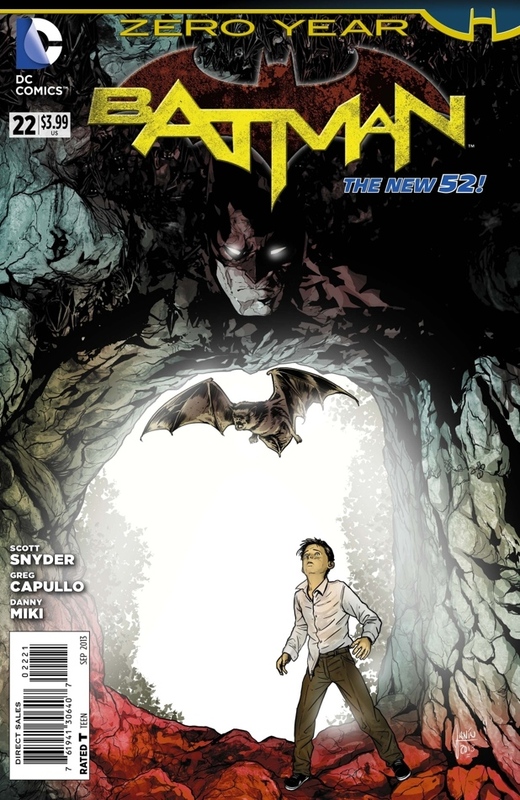 The scene where the young Bruce discovers the cave beneath Wayne Manor is one of the standout moments of Batman #22, running parallel to his adult self’s difficulties in apprehending the Red Hood while adjusting to life back in Gotham, and Capullo ensures this iconic moment is absolutely breathtaking as we catch our first glimpse of the bats flying towards Bruce in the light of the visual mapper. The scenes at the museum are another fine example of how Snyder and Capullo have made this title so successful. With the meeting between Bruce and Philip Kane initially playing out beneath the jaws of a T-Rex, with the exhibit of the Sphinx providing a nice link to this issues back up story, and Nygma’s first encounter with Bruce framed against the Egyptian game that depicts the circular Oroboros creature, Batman #22 brings together story, art, and legacy in a seamless fusion of past and present like never before. The cover by Greg Capullo and FCO Plascencia for Batman #22 encapsulates how Zero Year is beginning to forge new aspects to the legacy of the bat, and the variant cover by Mike Janin is equally as impressive. With a story by Snyder and James Tynion IV and art by Rafael Albuquerque, the backup story for Batman #22 features a secret event that occurred in Egypt, when Bruce was travelling the world in his quest to complete his training. Its an intriguing story, where an elderly Russian called Sergi teaches Bruce about sophisticated military technology, so he can find a way to use the components to escape from an airtight chamber beneath the Sphinx. Batman #22 is full of action set-pieces and great character moments, the pace never seems to let up for an instant, and the exquisitely crafted build up to Bruce’s run-in with Edward Nygma is brilliant. 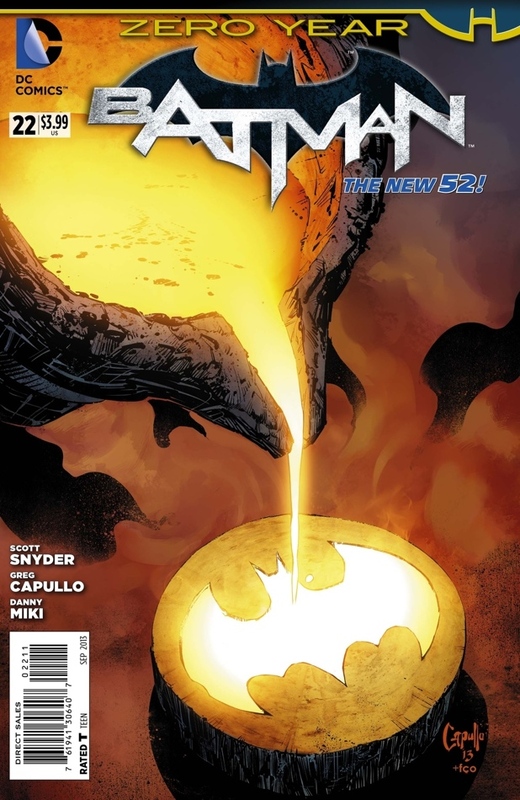 In the space of only two issues Snyder and Capullo have already begun to expand on the full scope and potential that Zero Year has to offer, infusing the story with enough symbolic imagery and subtexts to fill a batcave, and leaves us waiting eagerly for the next chapter as the cliffhanging ending brings Bruce’s world crashing down around him. While a crowd in Rio watches in horror as Captain Steel staggers from the fire pit, his body ravaged by flames and warning everyone about the Red Lantern trapped inside the pit, Hawkgirl encounters the new Batman in China during her investigation into Sam’s death. Tired of waiting for the World Army to strike at Steppenwolf in Dherain, Green Lantern, the Flash, and Doctor Fate decide to launch their own pre-emptive strike against the warlord of Apokolips – declaring war on Steppenwolf as they race across Dherain’s inland steppes towards the nation’s capital, Draemyre. James Robinson cranks up the action as the New Wonders of Earth 2 prepare to take on the next big threat to their world. 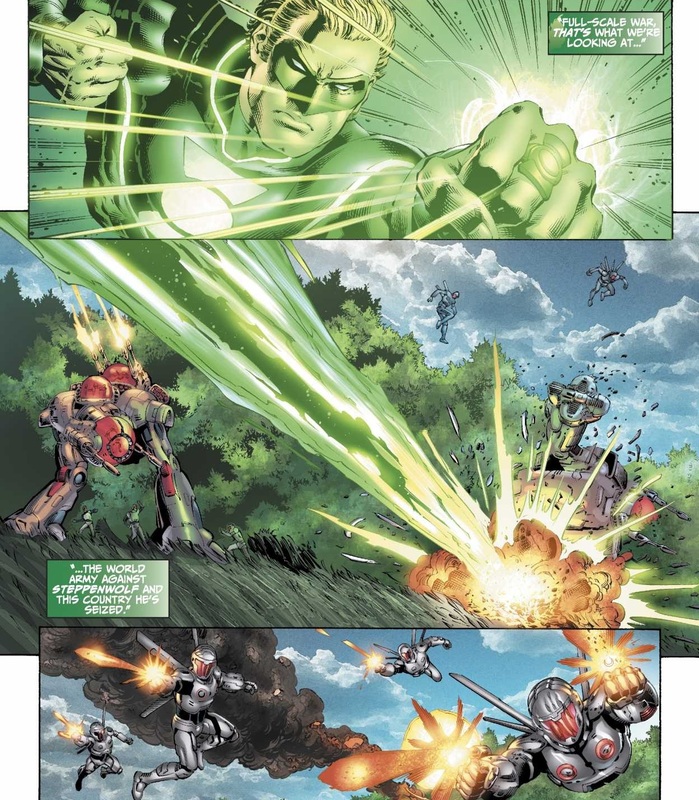 Green Lantern believes that by attacking Dherain ahead of the World Army invasion his Global Broadcasting Corporation will be able to use the media- spin to get public opinion on their side. 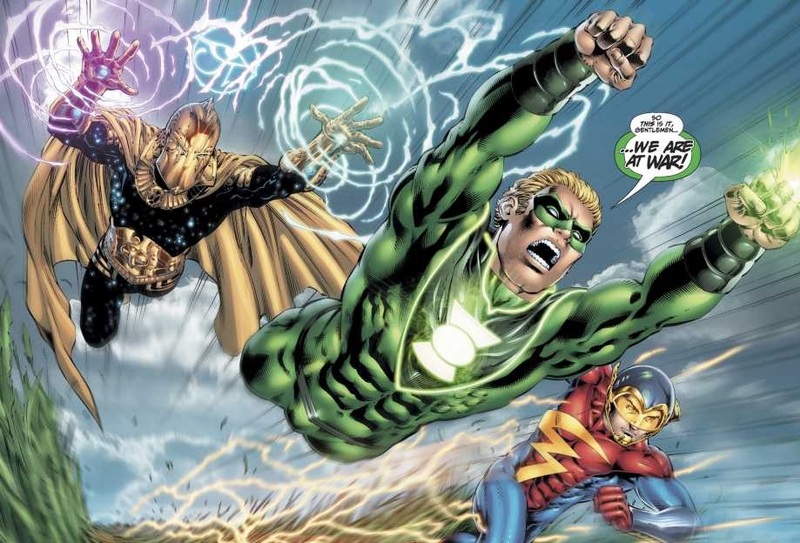 After boldly declaring war, Green Lantern leads the Flash and Doctor Fate into their first engagement with Dherain’s army. Although they make light work the opposition Doctor Fate is quick to warn them how achieving their goals may come at a price, and even he cannot predict the outcome with events as momentous as this. As Green Lantern, Flash, and Doctor Fate prepare to face another wave of troops, word of the New Wonders attack reaches Steppenwolf in Dherain. 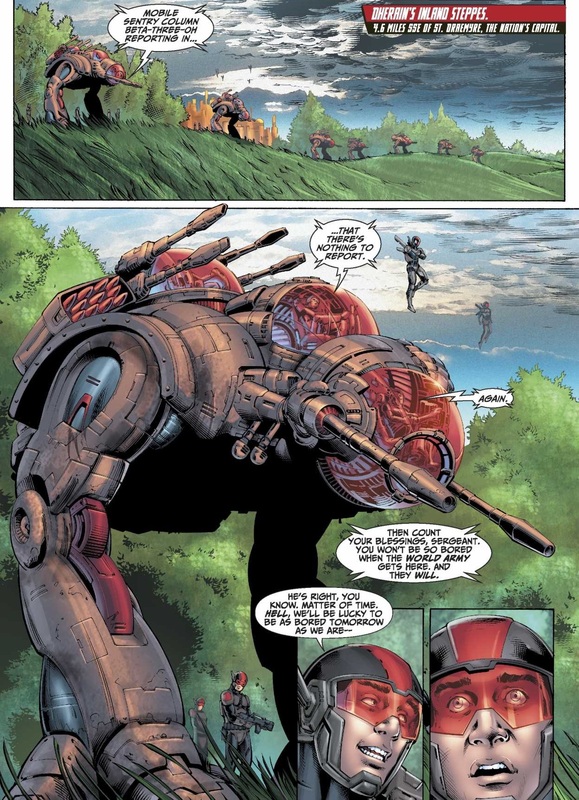 The warlord of Apokolips has been expecting them and orders the release of his “Hounds”. While a fleet of battle cruisers led by Commander Khan and General “Stormy” Foster prepare to fly into Dherain, the New Wonders are surprised when Colonel Dodds and his Sandmen, along with the Atom and Red Arrow, arrive to help them. Dodds understands why the new heroes of Earth 2 want to help, but he is worried their actions might impede the World Army, and potentially jeopardize the offensive against Steppenwolf. The tense standoff is broken when they are all attacked by Steppenwolf’s “Hounds”, three mysterious super powered beings, who vow to destroy them all. Earth 2 #14 is an incredibly fast paced issue, bursting with intense action, and Robinson also manages to squeeze in some great character building moments for the New Wonders as well. I like how Green Lantern is adapting to working with the other heroes, they are developing a great bond, and he seems more like a natural choice for leader now than he did in the early issues. The moment where Doctor Fate hinted that victory could come at a price was quite foreboding, and it highlighted just how significant this moment is for Earth 2. It was also great to see Colonel Dodds and his Sandmen again, although Flash wasn’t too pleased to see the Atom, and we finally get to meet another World Army operative – Red Arrow. Instead of brining Sloan to help with the invasion, Commander Khan has brought his own genius, Mr Terrific, to assist them. The addition of General “Stormy” Foster is also a nice reference by James Robinson to another All Star Squadron character from the golden age, the mystery man known as the Great Defender, Stormy Foster. Nicola Scott’s artwork on Earth 2 #14 is incredible, every page is overflowing with action as the New Wonders take the fight to Steppenwolf, the inks by Trevor Scott enhance every detail of the explosive advance on Dherain, and the glorious colors by Pete Pantazis helps convey the raw power of this first engagement. There are plenty of spectacular action set-pieces as Green Lantern, Flash, and Doctor Fate battle the Dherain army on the inland steppes, the World Army also make an impressive entrance as Dodds confronts the New Wonders on the field of battle. The fleet of battle cruisers make an imposing sight as they fill the sky, enhancing the suspense as the impending conflict with Steppenwolf looms on the horizon. Steppenwolf’s “Hounds” each have a very distinct look about them: one is a fearsome warrior clad in armour; there is a woman who appears to have some kind of energy powers, and scrawny looking man. Although we know little about them at the moment, or their powers, these dogs of war seem hungry for a fight, so it looks like we are in for one hell of a battle. Earth 2 #14 has a fantastic cover by Juan Doe, featuring a striking mural of the New Wonders of Earth 2 painted on a brick wall topped with barbed wire. It has recently been announced that Tom Taylor, writer of DC’s Injustice: Gods Among Us will be taking over as the writer Earth 2 with issue #17 in October, following James Robinson’s recent announcement that he will be leaving the series and DC Comics. Tom Taylor is an excellent choice to replace Robinson, he will join artist Nicola Scott, who is remaining with the series. While it is a great shame that James Robinson is leaving, I’m convinced that the series will be in safe hands with Tom Taylor, and together with Nicola Scott’s amazing art I’m positive they will continue to explore the limitless potential this title has to offer. With the announcement of Tom Taylor as his successor, the future of this title seems assured, and with all the speculation out of the way it will allow us to enjoy every moment of James Robinson’s last few issues on the series. I sincerely hope the majority of the outstanding storylines are resolved satisfactorily so that the transition will be relatively smooth and Taylor will be able to build effectively on what has already been established. The bells of St Dramemyre ring out in Earth 2 #14, much to the displeasure of Steppenwolf, to herald the onset of war as the New Wonders of Earth 2 lead the charge into battle against Dherian and its new ruler. This is another great issue of Earth 2 by James Robinson, it really feels like this storyline is building to an epic conclusion, with everyone banding together in the fight against Steppenwolf as the fate of this alternative world hangs in the balance.